Police seek the public's help in identifying the two young men who opened fire, wounding 10 people. 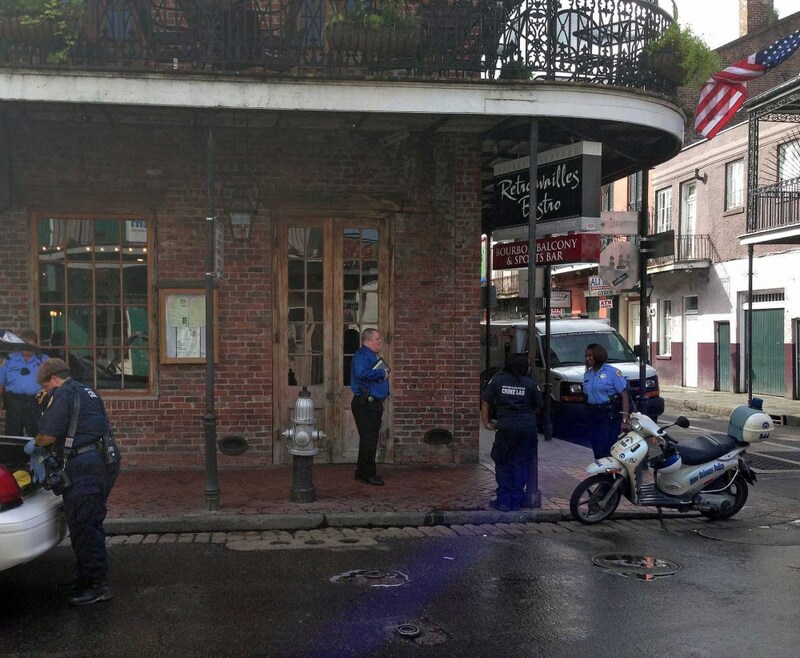 NEW ORLEANS – One person remained in critical condition Monday after a weekend gunfight on Bourbon Street, the historic thoroughfare of nightspots that is a major destination for visitors in tourist-loving New Orleans. Police said 10 people were hit when shots rang out about 2:45 a.m. Sunday. Five remained hospitalized at LSU Hospital. In addition to the critical patient, four were stable. Police initially said nine people were hit. On Monday, they added a 10th victim, a man who had gone to a station in a neighboring district about 12 hours after the shootings to report that he had been shot. He had a minor chest wound and refused treatment, police said. Police have not made victims’ identities and hometowns public but police said some were not from New Orleans. Police said there were six women and four men shot, ranging in age from 17 to 39. Images captured from a surveillance camera above a bar showed people running down the street in the chaos of the shooting. Police placed several views of the shootout online, asking for the public’s help in identifying the two shooters. Minsky said he had just gotten off work as a bartender at another business and was sitting in a Bourbon Street bar when he heard the shots. He said he took off his shirt and used it to try to control the bleeding of a woman who appeared to have been shot in the face. The violence happened as New Orleans prepares for a major summer tourist event: The annual Essence Festival opens Thursday and runs through the Fourth of July weekend. What sparked the shooting remained unclear. “What happened was two young men got angry at each other and shot at each other,” Serpas said. Louisiana State Police Superintendent Mike Edmonson said he and Serpas discussed the shooting Monday. He said they are looking at ways to redeploy state police resources already in New Orleans. He said 44 troopers work in the area daily in various capacities, including narcotics, gaming and criminal investigation. The scene on Bourbon Street on Monday was business as usual, with music blaring from bars as tourists strolled, drinks in hand. On Sunday, visitor Justin Sigalos of Chicago stood at the scene of the shooting, looking at the bloodstained sidewalk, saying he would not let the violence keep him from visiting again. “Just understand that things happen and you’ve got to do your best to avoid putting yourself in that kind of situation,” he said. It was the third major shooting on Bourbon Street in the last three years. On the Saturday before Mardi Gras, four people were treated at a hospital after a shooting. During Halloween in 2011, one person was killed and seven others were injured after gunmen opened fire on each other.